Discover Riobamba during your price guaranteed Ecuador vacation. All of our Ecuador tours have daily departures and are fully customizable. Travel to Riobamba, the heart of the country, on your Ecuador vacation. 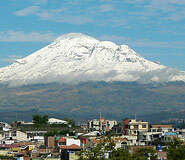 The capital city of the Chimborazo district, Riobamba sits atop a large plain with snowcapped peaks in the background, including Ecuador’s highest peak, Chimborazo Volcano. Riobamba is an important commercial hub for the highlands, and it is also a city full of culture and tradition. The ideal jump off point for hiking and trekking tours in the region, Riobamba is the perfect destination for your Ecuador vacation. This small city is the common base for trekking and climbing Ecuador tours; however, the city also holds a fascinating history and is home to many museums, churches, and important colonial buildings. Riobamba was the first city founded in Ecuador by the Europeans and though the city was destroyed by an earthquake in 1797 it was rebuilt and marks the site where Ecuador’s first constitution was drafted in 1830. Today locals and tourists alike can explore the city’s wide cobblestone avenues and admire its many colonial buildings and charming parks and plazas. As the closest town to the Chimborazo Volcano, the city of Riobamba is a favorite amongst trekkers and the perfect place to launch tours to the volcano. 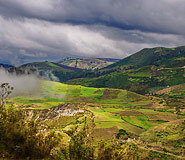 Riobamba offers travelers a wide variety of historical, cultural, and adventure activities for their Ecuador vacation. For travelers looking for a taste of history, Riobamba’s many churches, museums, and colonial buildings offer plenty to explore. The Museo de Arte Religioso is home to a variety of 17 and 18th century art and is arguably the best museum in the city, housing stunning artifacts such as a spectacular gem-encrusted monstrance. Visit one of the many churches found throughout the city such as the Santa Barbara Cathedral, featuring impressive colonial stonework, or the Basilica of the Sacred Heart of Jesus which is topped with a spectacular dome. Explore one of the city’s many beautiful plazas and parks including Parque Sucre, Parque 21 de Abril, and Parque Maldonado, the city’s main plaza. The plazas and parks are adorned with fountains and greenery and locals are often seen enjoying a picnic here. Visitors can take a stroll through the many quaint avenues lined with small shops or visit the market, open throughout the week except on Sundays. Take advantage of Riobamba’s close proximity to Chimborazo Volcano to go on thrilling trekking and climbing adventures. 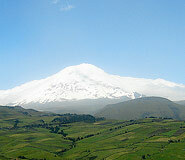 Chimborazo is the highest peak in Ecuador sitting at 20,702 feet (6,310 meters). The crossroad for the “Devil's Nose,” one of the most difficult railways in the world, can also be easily accessed from Riobamba. The exciting train ride will allow you spectacular views of Chimborazo and the entire surrounding landscape. Riobamba has 2 distinct seasons: the dry season which falls in the northern hemisphere’s summer months and the wet season which coincides with the northern hemisphere’s winter. During the dry season temperatures remain slightly chilly due to the city’s high altitude. Typically, temperatures are in the range of 65-80 °F (18-26°C). However, temperatures can be much lower, so packing layers is suggested. The wet season brings rain and it is recommended to pack a rain jacket for hikes and even exploring the city. The temperatures in general for both of Riobamba's seasons are comfortable, but it can get cold when the sun is not out and when wind gusts from the Andean highlands come in. For hiking and climbing tours on Chimborazo, it is best to travel during the dry season, June through August, when temperatures and weather will be more enjoyable. Our trip to Ecuador and Peru was fantastic. All the planning and arrangements you made for us were just perfect. The schedule was full but not too busy. Our Galapagos trip also went without any problem. Very efficient and courteous staff. We would like to thank you for your efforts. The Abraspungo Hotel, a restored hacienda in Riobamba, is widely recognized as one of the finest hotels in the area. With its spacious rooms and common areas, guests will find the hotel relaxing and pleasant. Among the hotel’s excellent amenities are a business center and spa, ideal for both business and leisure travelers. For guests traveling between Baños and Cuenca who want exceptional accommodation, the Abraspungo Hotel is an ideal choice. Located over 9,000 feet above sea level and nestled into the Andes mountains, this picturesque hacienda specializes in personalized service. Each of the 42 rooms offers the charm of colonial architecture with modern furnishings and amenities. Dine in the excellent restaurant serving traditional Andean fare, relax in the gardens, or enjoy a nightcap in the bar. With its cabin-like feel and expansive, scenic grounds, this semi-rustic Riobamba hotel is cozy, comfortable, and perfect for travelers breaking up a long trip between Baños and Cuenca. Thirty minutes from Baños along the Panamericana Highway and close to the staggering Chimborazo Volcano, this homey hotel welcomes travelers with cozy fireplaces and friendly staff. Guests will find large, spacious rooms with antique furnishings, carpeting, and private bathrooms. Enjoy the views of Altar and Tungurahua volcanoes from the peaceful grounds in the Guano valley and dine in the delicious restaurant that frequently hosts live music. The elegant, modern Hotel San Pedro de Riobamba offers excellent service and accommodation in the heart of the Ecuadorian countryside. It is ideally located close to the train station and within walking distance from all restaurants, shops, and other attractions in Riobamba. Beautifully blending colonial and modern styles, the hotel provides comfortable rooms in a beautiful décor. From the wooden floors to the dim lights, from the classic furniture to the crisp white walls, this hotel is a haven of tranquility. This Riobamba hotel is the ideal option if you are looking for an intimate setting and the feel of a luxury boutique hotel at excellent value.